Delta 4 is a mixed media original on stretched canvas. It measures 24" X 30" x 1.5"
Delta 4 emerged as I layered the powdered pigment on a acrylic underpainting. The end result of this original is reminiscent of an aerial view of the river delta in Northern California, This is a stunning one-of-a-kind mixed media painting. Delta 4 can be hung alone or paired with Delta 5 as a diptych. This painting is slightly textured. Use the wall preview feature and/or the Augmented Reality tool to get a glimpse of how this painting will show in your home or office. Delta 4 is reminiscent of a marshy river delta. Delta 4 emerged as I layered the colors on a canvas with a rusty red-brown underpainting. 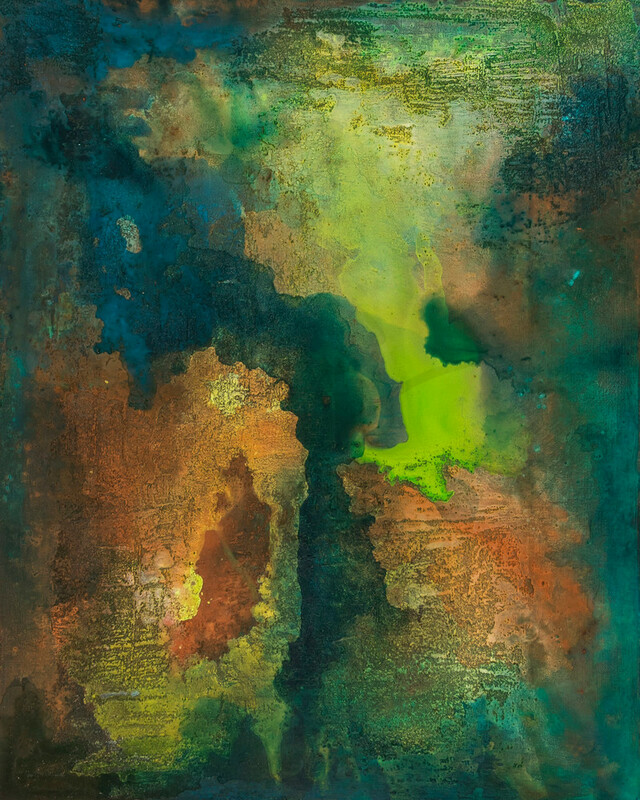 The blue-green with its complimentary orange created a painting with movement and balance. This painting is stunning as a fine art print on metal, canvas or fine art paper. Use the wall preview tool to get an idea of how this painting will look in your home or office.